You are here: Home / Technology / Gadgets / Google Home vs Amazon Echo: Which Smart Compact Speaker Is Best for You? Google Home vs Amazon Echo: Which Smart Compact Speaker Is Best for You? In this modern era conversion of dated homes to smart homes has become a trend and fairly a good one in many aspects. Yet if you are to find the best products you will come across two leading names: Google Home and Amazon Echo. Though you have seen Amazon Echo was the first to come into vision and rule, Google Home is actually becoming reasonably famous and beneficial. Let’s dig into Google Home vs Amazon Echo. Let’s talk about these two giants and find out who stands out. So what are they, actually? Well, at the core level they are smart compact speakers capable of answering your questions with the help of a built-in virtual assistant. It all starts with the voice and that voice is the main source of difference that comes first. While Google Home is built in Google Assistant, Amazon Echo is built in Alexa. And Google Assistant is a better option in terms of smartness and the feel of voice tone. Arguably Google Home is capable of handling answers correctly more and is also effective in fetching general information. But Echo is good for retail and business. Though Echo has a lower price tag, but, it is more beneficial for people with Amazon Prime subscription as you are going to get some additional features. Or else Google Home is the one which is a bit pricey, but it is for everyone. This doesn’t mean you one cannot buy Home if they are Prime members. It is just that it makes more sense to buy Echo for Prime members. This is now a major point to talk. The design has been the first positive side of Google Home. it is absolutely perfect for any home environment which has a height of 142.8mm and weighs 477g. The coloured lower half of the outer surface is brilliantly done to capture the eyes and it is the part concealing the speaker. One can pick their choice of colours from Mango, Coral Violet, and Marine. For people liking metal bases, there are Carbon, Copper and Snow. With Echo, the customisation idea is on the way. So, for now, you can only get the cylindrical looking object that looks much sturdy and professional, but not many would prefer. When listening to podcasts and news briefings you may not understand the difference but while you will surely during streaming audio. The sound effect and clarity is not crisp and does not have fine quality. In comparison to this Google Home wins the race. The sound quality is of much better quality. It has a nice balance of bass and crispness with its effective driver and passive radiators. 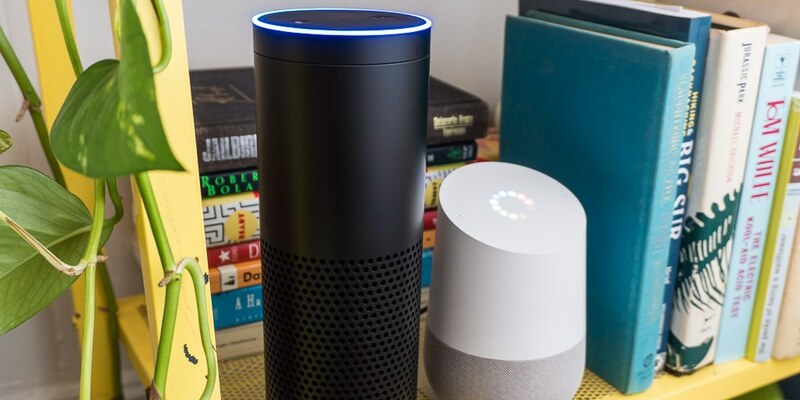 Both Google Home and Amazon Echo do almost similar activities such as answering your questions, controlling your home and tech along with streaming audio. But in terms of natural conversation, Google assistant is very smarter and efficient. There are times where Echo may tell you that it did not know the answer. Google has a lot of advantages with features such as fetching answers from Gmail, Maps, Android and other services. Once you are a signed member you can add your appointment timetable, calendar, traffic check and more. And it can talk to Chromecast, Chromecast Audio ad any speakers supporting Google Cast. Echo has options for service integration and these integration programs are called skills. But there are a few skills which are hardly required in day to day to life. So it makes no sense to set the program for such a skill and then remember the command. It completely depends on your choice, requirement and budget when it comes to you to choose anyone. So, make sure you know what you need to make your home a smart one.